Comment Since Last Visit is a simple WordPress plugin that highlights new comments made on posts since a person’s last visit. It does this by using cookies to store the last visit time for each post viewed. When the person revisits a post, it compares the last visit time for that post to the time of the comments. For each comment that is new, it adds the new-comment CSS class. You can target this class in your themes to control how it looks. 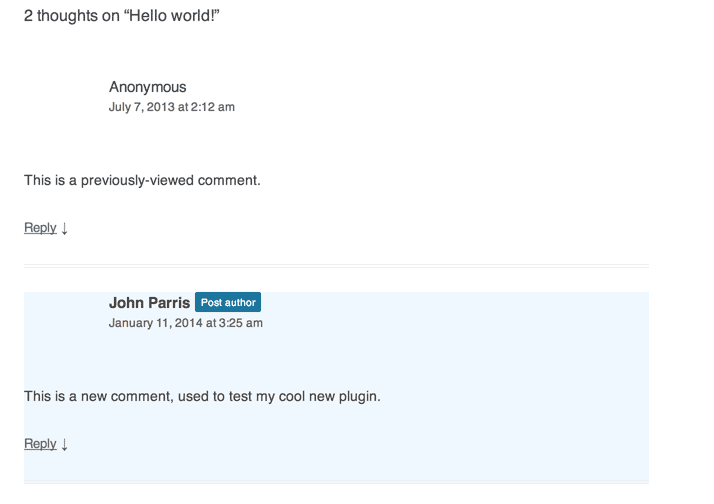 By default, the plugin simply adds a light blue background color to new comments. This plugin was made for developers and is therefore simple. It currently has no options to change the highlight color or any other CSS. If you need to do that, edit the core plugin file. If you’re a developer and would like to contribute, Comments Since Last Visit is on Github. For a little history on this plugin, see this post. Download Comments Since Last Visit. Two comments: one old, one new. If you need paid support for this plugin, get in touch.